By: Joshua Swainston, content marketing writer, Omax Corp. 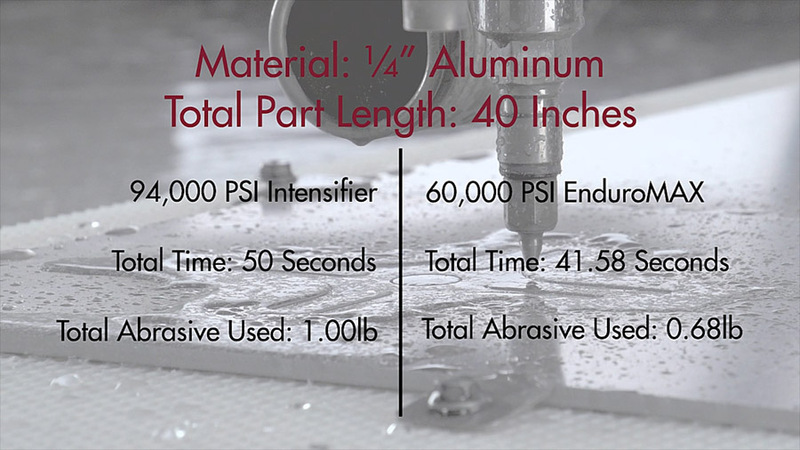 Unlike many conventional machine tools, abrasive waterjet uses a flexible cutting medium. Using waterjet to cut offers a plethora of advantages, including no heat-affected zones and no limitations on material type. Moreover, waterjet shows its true potential when cutting sophisticated geometries in an assortment of materials. Yet, not all waterjets are created equal. To get the full value of an abrasive waterjet, the tool needs to be comprised of the best hardware coupled with optimal software. Optimal software is capable of extreme precision throughout every angle in a cut while also increasing the speed of production and reducing the cost of consumables. 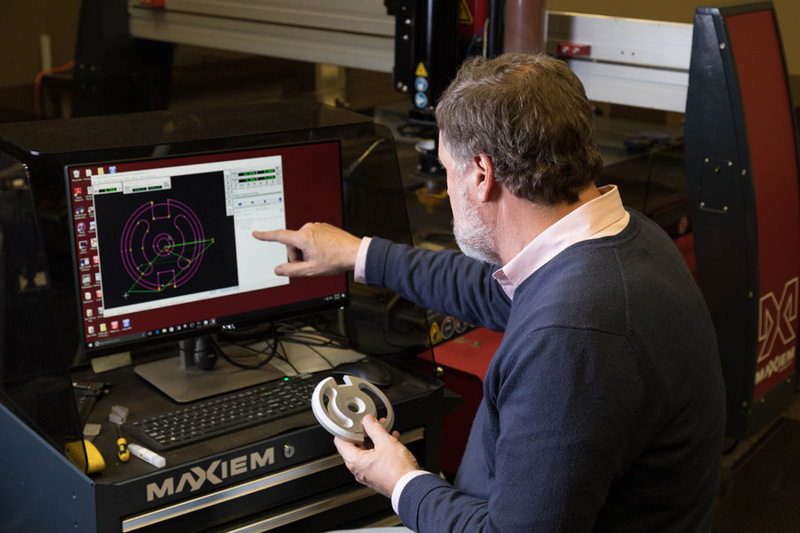 Knowing those potential outcomes, Omax, over the past 25 years, has continually reinvented its controller software, Intelli-Max Make, by developing better cutting models. A test part to be cut with Omax’s fourth-generation software shows corner passing and speed. Taking its own approach to software design, Omax has taken Intelli-Max through several iterations, working to hone abrasive waterjet cutting as well as responding to customer needs. To do so, Omax conducted thousands of empirical tests on thousands of material samples to understand how the waterjet functions with each. In the 1990s, the first generation of Intelli-Max software was built on a geometry that revolved around the way an abrasive waterjet behaved. It specifically looked at a waterjet as its own cutting method rather than using standard CNC G-code to operate the waterjet machine. The third generation of the software’s cut quality and speed were improved when better computer processing power and better code capabilities allowed for a stronger understanding of corners and motion control. Today, the fourth generation of Intelli-Max has advanced even further as the result of a deeper exploration into cutting models. The fourth generation is the most integrated controller available, allowing for faster acceleration and deceleration and a faster, higher quality cut. To showcase the cutting model advancements, consider the following example. 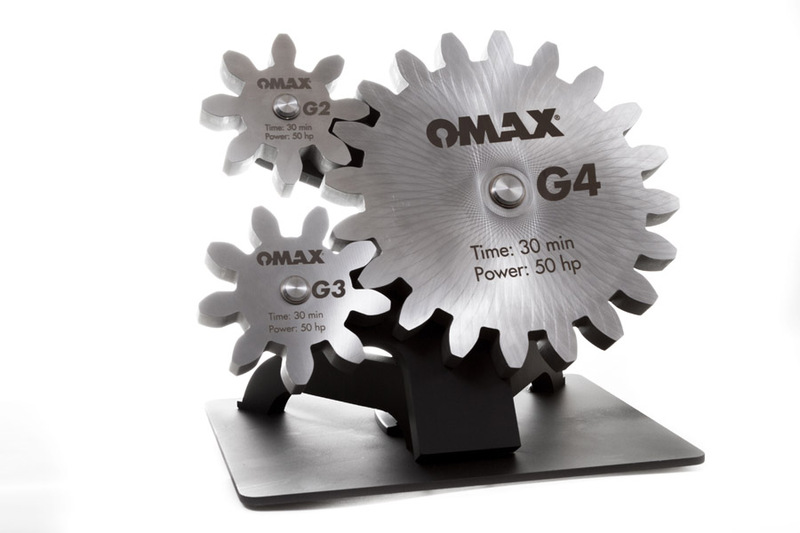 With second-generation Intelli-Max, an Omax waterjet was able to process a gear with eight teeth and 26 in. of tool path in 30 min. With fourth-generation Intelli-Max can cut 20 teeth and a 63-in. tool path in 30 min. Software progress moves beyond standard abrasive waterjet operations, however. The Tilt-A-Jet, as just one example, is an optional feature that places the nozzle at an angle calculated by the software to exactly offset the taper from the jetstream. By understanding how the waterjet’s jetstream operates and then entering that into the cutting model, the Tilt-A-Jet is able to compensate for taper. The taper doesn’t disappear but is moved to the scrap part of the material, leaving a part with exactly square edges. Programming a part is easier then ever thanks to the advancements made to Omax’s IntelliMax software. With a tilting head, the controller can speed up on straight sections by tilting into the cut to improve the surface quality without having to slow down much. By applying this approach, cutting operations became smoother and subsequently faster. For operators, it’s a simple click of a button to enable taper compensation, an option that is generally left on throughout all operations. Clearly, evolved software can make a huge difference in efficiency. For example, compare the cuts of a 40-in. tool path with a 94-ksi intensifier pump with second-rate software, with cuts made by a 60-ksi direct-drive pump paired with better software. The former cuts a part in 50 sec. and uses 1 lb. of abrasive while the latter cuts in 41 sec. and uses only 0.68 lbs. of abrasive. The time and abrasive savings are obvious when the improved software is complementing the efficient direct-drive pump. In addition, because the intensifier pump is working much harder, wear on the pump and plumbing can erode the waterjet system faster. That’s not to mention the additional cost of the extra water, electricity and spare parts involved. Fortunately, by coupling better software with a more efficient 60-ksi pump, time and money can be saved. Abrasive waterjets live in a world of automated machining. The machine tool industry has adopted mechanized technologies in the forms of modern motion systems, robotics and on-screen control formats, which laid the groundwork for waterjets to be a viable entity in any manufacturing or fabricating shop. Because of the physics of the waterjet’s jetstream and the variations of cutting models, advanced software control is truly the only way to make waterjet technology an economic reality. The evolution of cutting models from Omax’s second-generation software to its latest fourth-generation software. Always looking toward the future, Omax recently began working with Frustum, a software firm that leverages AI for next-generation product design, to explore a way in which generative design can be implemented into waterjet cutting. Though generative design has primarily been a 3-D printing application, the benefits of the process are starting to be recognized within the entire manufacturing industry. Generative design is a process in which one provides geometry interfaces and constraints allowing the software to generate the geometry to optimize and meet those constraints. For example, generative design could show how a specific part could be made to weigh less. Or, a designer could implement parameters to ensure that typical stress points are beefed up. Another major advancement for the machine tool industry is Industry 4.0. The integration of cognitive computing, central monitoring and overall interconnectivity of a manufacturing floor is not as sci-fi as it may seem. In fact, it is becoming quite the norm. With Omax’s Intelli-Visor system monitoring package, users can increase efficiency and reduce downtime by connecting operation controls with machine maintenance and upkeep. Intelli-Visor goes further by integrating real-time cutting data from devices across the Omax or Maxiem JetMachining Center line of products through its streamlined software interface and robust machine sensor network. Running in parallel with other programs in the Intelli-Max software suite, Intelli-Visor is simple and highly adaptable for the end user. The monitoring software is just the next step for abrasive waterjet in the process of true Industry 4.0. Considering time and abrasive costs can quickly add up, the 60,000-psi option offers significant savings. Apart from design and interconnectivity, the upcoming advancements in waterjet are still all about the cutting models. As Omax has progressed through each cutting model generation, the finished part has gotten faster, more cost-effective and with a better finish. While the fourth generation of its software suite has been a great leap forward for Omax and its waterjet user, what’s next on the horizon? As Omax’s software team continues to investigate the behavior of abrasive waterjet cutting, they will implement their findings into a next generation of the cutting model and the next generation after that. With each evolution of its software system, Omax users have been able to cut better finished parts faster and with less use of resources, including the abrasive as well as the required water and part material. Ultimately, this trend will continue into the future.